For more than thirty years, OMATION letter openers have been a staple in mailrooms across the globe. The Omation Model 306 letter opener provides significant technological improvements over its OMATION predecessors, which have been the world’s best selling envelope opening devices for more than a decade. 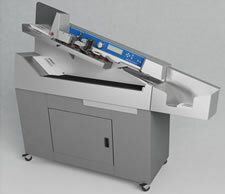 The Omation Model 306 letter opener, with its ability to operate at a rated speed of up to 40,000 envelopes per hour, contains OPEX’s latest mail opening technology and sets a new standard for high volume mail opening. The improved milling cutter with 8 cut-depth positions removes chips as small as 0.01” from the envelope edge, producing a soft, feathered edge while protecting valuable envelope contents. Even overnight delivery envelopes are no match for the Omation Model 306. Equipped with a new and robust operator control software interface, job setup can be done with ease and flexibility.